The multi-year fiber-to-the-home upgrade construction project in Eagle Mountain will be completed in 2018. Over the past 3 years, Directcom has installed new fiber to about 4600 homes in Eagle Mountain. This means that over 8000 homes in Eagle Mountain now have access to fiber-to-the-home service. Our fiber upgrade project will continue through the end of 2018, so that by the end of the year, essentially every home in Eagle Mountain will have access to fiber to the home service. So, who is getting fiber in 2018? Looking at the network map of Eagle Mountain, the remaining subdivisions left on copper are: Mt Airey, Lone Tree Copper, Mustang Copper (North Ranch), and Rock Creek copper (includes Willow Springs, Simpson Springs and Kennekuk). This represents a total of about 600 homes or apartments still served by copper that will be upgraded to new Fiber. First up to join the Fiberhood in 2018 will be Mt Airey and Lone Tree this spring, followed by North Ranch and the Rock Creek area towards the end of this year. We will be holding separate fiber open houses for Mt Airey and Lone Tree residents in March 2018, a couple of weeks before construction begins. These will be informal events where the company will further outline the construction schedule and upgrade plan, and answer any questions one-on-one about how the construction will affect you, how residents can best prepare for fiber to the home, and how fiber will improve the quality of life for residents in Eagle Mountain. We will send out invitations to those subdivision residents with more details at the beginning of March. While main construction will be completed in 2018, individual fiber cutovers will likely extend into early 2019 due to this particular project difficulty, especially in the North Ranch area, where lots are larger, and the loop distances from the street to the actual home are longer than usual. This will require more time to install fiber to each home. These last few construction projects are part of the push by Directcom to convert every neighborhood in Eagle Mountain to fiber. 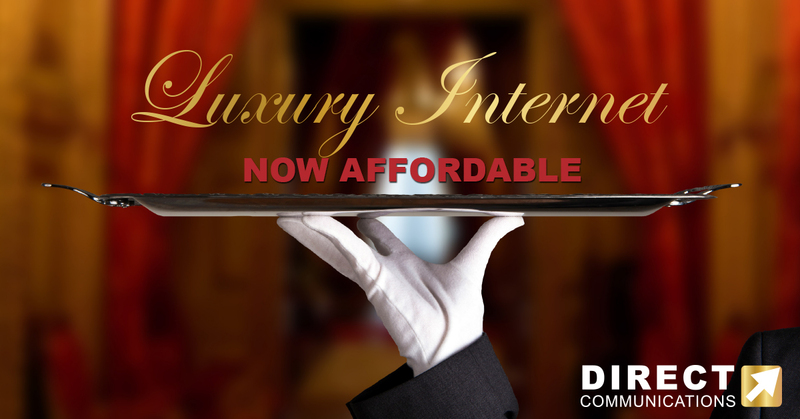 Luxury Fiber Internet will soon be yours. During 2017, Direct Communications upgraded another 1300 homes to fiber. Chuck McCown, Operations Manager for Direct Communications, explained that the 2018 projects will be similar to the other projects completed in recent years, in that the in ground construction work will mostly be done by utility contractors, in order to speed up the upgrade process. However, the final splice to the home and cutover to fiber at the home will be completed by Directcom’s own techs, who will be installing Optical Network Terminals on the outside of customers homes. Another contractor, Phelps Electric will be out at the same time installing outdoor power supply on houses to power the fiber electronics on the side of the homes. Since fiber does not carry an electrical signal like copper, each fiber terminal needs a power supply to power the electronics which convert the digital laser light to an Ethernet signal inside the home. The condition of existing copper laid by the original property developers. Much of the original copper is in dire need of an upgrade, and where the old copper is causing the most problems for both customers and the network techs, the company will often seek to upgrade those areas to fiber first. 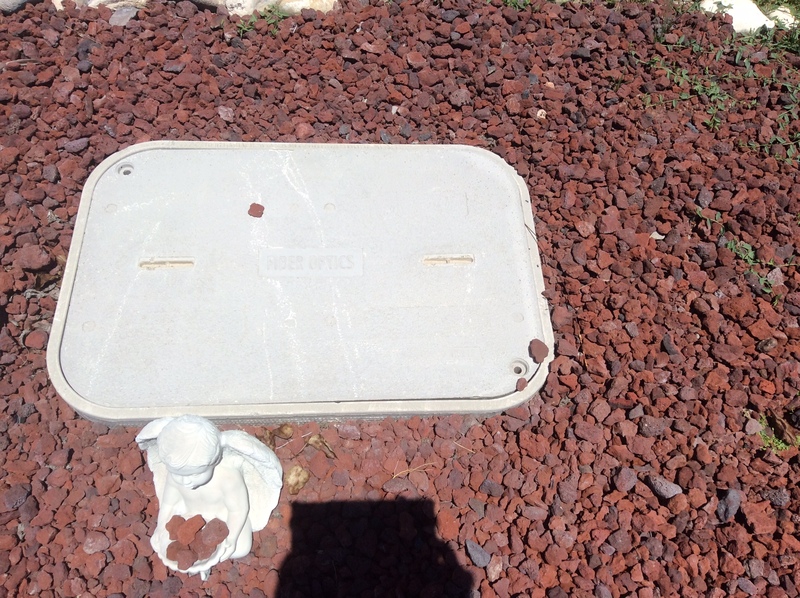 Buried Fiber Handhole, which will replace the old above-ground copper PEDs. This one was decorated very nicely by a resident in the city center area. Generally, yards and gardens will not be disturbed, except where existing telephone pedestals are located at the corner of property lots– these pedestals will be replaced with handholes, which will be buried and placed level to the ground, which the company hoped would be welcomed by homeowners, since having no visible equipment would enhance curb appeal of the neighborhood. Most yards do have existing conduit from the old copper pedestals to the home, so crews should be able to pull new fiber through to the side of the house without disturbing the yards or lawns. Click on the “view larger map” icon on the top right bar of the network map below, and enter your address in the search field in the google maps interface to see if fiber is already installed at your home or future home. Yellow areas are Fiber-to-the-home. Blue areas are still copper to the home, and will be upgraded to fiber in the future. Red is under fiber construction.